Cut washed potatoes into 1-inch pieces. Place in a pot and add water to a few inches above the potatoes. Bring to a boil. Cover and lower heat to a gently boil. Cook for 15-20 minutes, or until potato pieces are tender. Strain and drizzle with vinegar. Set aside to cool. When potatoes are cooled, stir together remaining ingredients: mayonnaise, yogurt, onion, celery, cranberries, curry, and cayenne pepper. Season with salt and pepper. Keep chilled until serving. One of my favorite gifts from my wedding shower was a 1969 edition of the classic Betty Crocker Cookbook. One of my friends scoured used bookstores to find a vintage edition for me and settled on a 1969 version. I love having all the old, classic recipes at my fingertips. 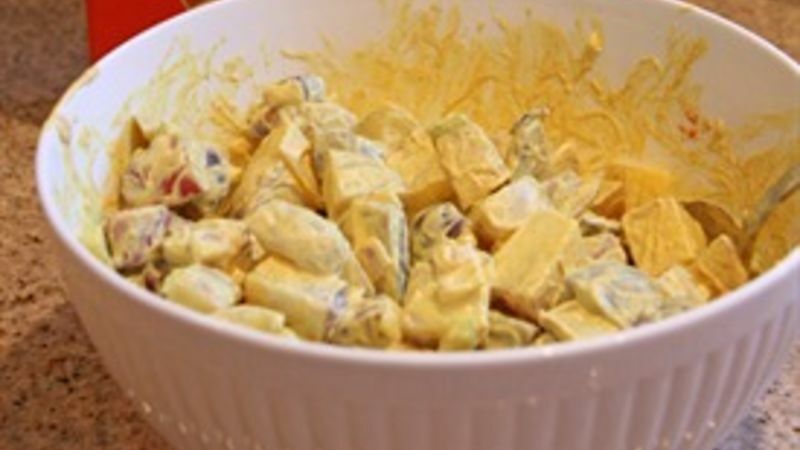 Potato salad is always a favorite at gatherings. While I love the classic version, I also love my updated version, a curry potato salad. It’s lighter and quicker, and it has a little kick that people love! Keep chilled until serving. Enjoy!